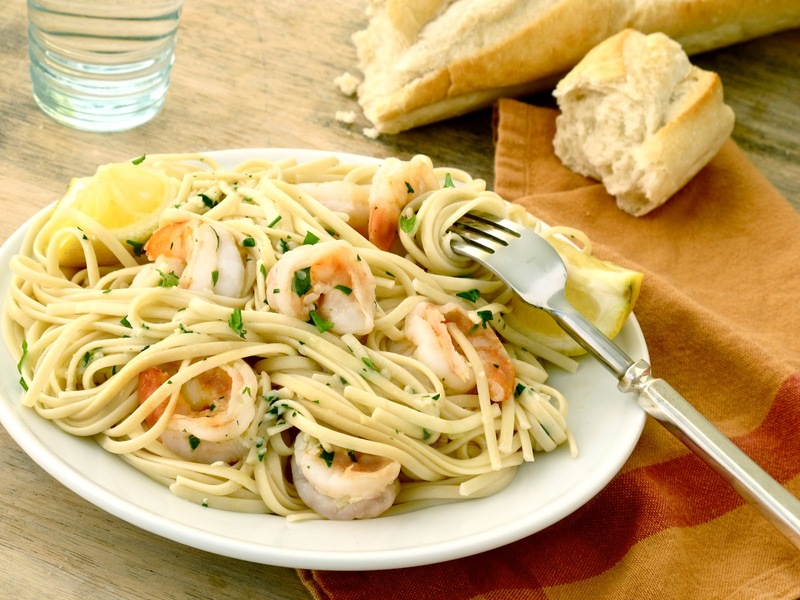 My go-to quick dinner is often times Shrimp Scampi with Linguine. I'll fix it on a Sunday night after we get home from traveling over the weekend, or a quick dinner for one if Mike is out of town. It is one of my favorites to fix for company - it somehow seems elegant, but costs very little to make ($15 for four people) and takes 10-15 minutes. 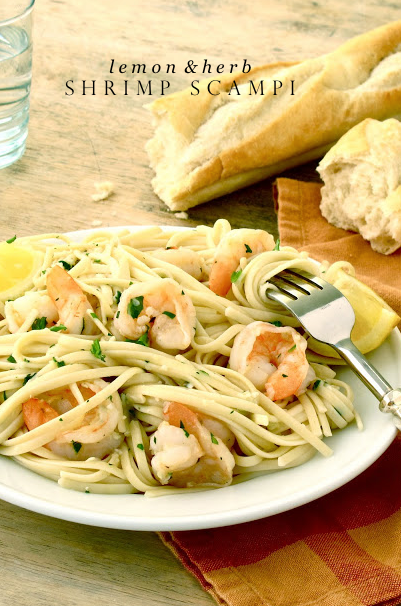 Boil some water, saute garlic and shrimp, serve a salad and some crusty bread... done! Like most great Italian 'recipes' the recipe is not really a recipe, but a list of ingredients. If you don't have any white wine around (and don't feel like opening an entire bottle for a Tuesday night dinner... by yourself - hey, maybe you do!) you can leave it out. No butter? Just use olive oil and maybe a little extra garlic for more flavor. Want to throw in some spinach to add some nutrients? Go ahead. This is an ever evolving recipe for me. On any given night, I'll add tomatoes, mushrooms, spinach, pancetta, basil, olives or some heavy cream. Go crazy. For dinner last night, I reverted back to the classic version. It is nice to go crazy sometimes, but can be just as nice to keep it simple. Here's the basic recipe to get you started. Prepare all of your ingredients before you add the pasta to the water - the sauteing will go very fast. Peel and devein the shrimp. Mince the garlic and parsley. Juice the lemon. Add 1-2 tablespoons of salt to the boiling water, then add pasta. Stir the pasta as it cooks to make sure it doesn't stick together. It will cook for about 5 minutes. When you drain the pasta, reserve 1/2 cup of the cooking liquid in a separate bowl/cup to use if the sauce needs thinning. Meanwhile, In a large saute pan heated on medium, add olive oil and garlic. Saute for just 30 seconds until the garlic begins to bubble. Add white wine, raise the temperature to high and let the mixture simmer for 2-3 minutes until it slightly reduces. Add butter. Add shrimp. Cook the shrimp for just a minute, then turn them to cook for 1 more minute*. *If you are using very large shrimp it may take a little longer. Lower the heat to a low simmer. Add lemon juice, parsley, salt pepper and cooked pasta. Toss together and serve. We're huge fans of the quick pasta dinner around here! Looks delicious. Jenny, the recipe looks great! If one was going to add heavy cream, how much would you suggest and how would you go about doing it? Thanks!